Do people with similar personalities look alike? Might they resemble each other in their expressions, facial features, body language, or physical appearance? One example of this mind-body overlap is the relationship between emotions and facial expressions. Social psychologists have shown, for instance, that our facial expressions are associated with specific emotions and are interpreted similarly across a breadth of human cultures. This suggests that, irrespective of language or culture, emotions can be conveyed through physical expressions. Seeing the face as humanity’s hub for emotional expression, some theorists have gone a step further and suggested that facial features, if properly understood, can serve as important clues about our personality. At first blush, this may sound a bit preposterous. After all, isn’t it more or less a genetic lottery that determines whether we get mom’s eyes or dad’s nose? Why would our physical appearance have anything to do with our personality? But consider this: Even if our physical features are genetically based, could it be that the genes and hormones that contribute to our appearance also affect, or interact with those that affect, our personality? Is it unreasonable to suspect, for instance, that individuals who are heavily muscled and have higher levels of blood testosterone might also have a more aggressive personality? We must also consider how our habits and behaviors might influence our physical appearance. For example, those who exercise or routinely engage in physical activity are apt to have larger or more developed muscles than those who don’t. The same is true of our facial muscles. Those of us who smile a lot are in effect, exercising our “smiling muscles,” and may thus end up looking different from those who smile less often. These observations lend support to the idea that our personality and behaviors are not unrelated to how we look. Thus, to a certain extent, our appearance may serve as a window to our soul. Moreover, that window is apt to be larger for those who are skilled at perceiving and interpreting bodily clues. Indeed, developing this sort of skill and knowledge is the express aim of practices like face reading and physiognomy. Acquiring psychospiritual knowledge (“gnosis”) by observing the body (“physio”), or what has come to be known as physiognomy, has been an implicit practice of human beings ever since we began trying to read other people’s minds. At some point, certain individuals made this practice more explicit, such as by attempting to match particular facial features (e.g., types of noses) with certain personality traits. Modern physiognomic research has largely abandoned any emphasis on specific facial features in favor of “configural” approaches, in which the face is interpreted holistically based on overall impression. This approach is rooted in science which suggests that humans tend to process facial information in a holistic or intuitive fashion. In a 2006 study1 published in the peer-reviewed journal, Social Cognition, Ian Penton-Voak and colleagues utilized both individual and composite facial images. The composites were generated by computer software that combines multiple faces into one; you might think of it as a sort of “average” of the images. More specifically, the composites incorporated facial images of those scoring in the top ten percent for each of the Big Five personality domains (To preserve the flow of this discussion, I have taken the liberty to translate the Big Five categories into Myers-Briggs terminology. Research has demonstrated moderate to strong correlations between these two personality taxonomies). 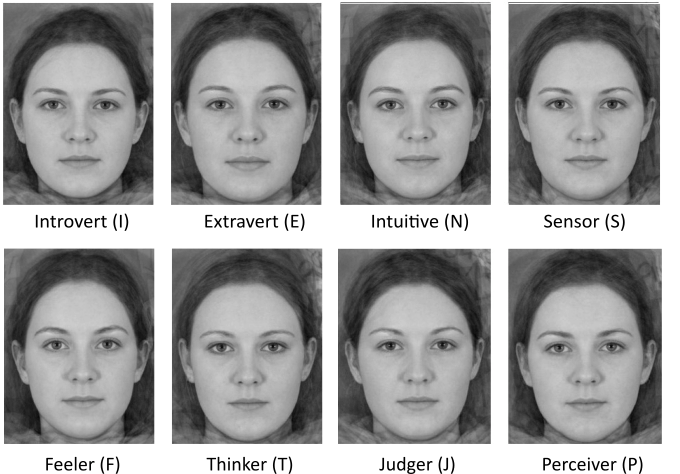 The judges / raters of personality in this study were given no information except the facial images (see below) in conducting their assessments. They also had no acquaintance with any of the individuals whose photographs were utilized in the study. The most significant finding of this study was the ability of the raters to accurately distinguish introverts from extroverts. This was true for both the male and female composites, as well as for non-composite images (i.e., actual photos of the individuals). Beyond the introvert-extrovert distinction, things proved a little more difficult. The assessors were able to differentiate thinkers (T) and feelers (F) of both sexes, but only when using the composite images. The judging (J) – perceiving (P) preference was only identifiable in males and only in the composites. The intuition (N) – sensing (S) preference was also discernible only in males, but this time only in the non-composite images. Based on these findings, the researchers concluded that there is at least “a kernel of truth” to be found in the practice of face reading. In all cases, introverts were distinguishable from extraverts. In some cases, T-F differences could be discerned in males and females. In some cases, S-N and J-P preferences could be discerned, but only in males. As early as ancient Greece, human beings were working to identify and read “body types.” Around 430 BCE, Hippocrates posited two primary body types, one characterized by a thick and muscular build and the other by a more delicate, elongated appearance. A couple hundred years later, the Roman physician Galen identified several different temperaments (sanguine, phlegmatic, choleric, melancholic), each of which he attributed to a certain proportion of four bodily fluids—blood and phlegm, as well as black and yellow bile. Despite this ancient interest in body typing and the biological basis of temperament, it was not until the early 20th century that more complex and substantive theories were offered. The most influential and extensive of these was promulgated by William H. Sheldon.3 Sheldon displayed an insatiable curiosity for what he called “constitutional psychology.” While other researchers were working to isolate and analyze personality traits, Sheldon was determined to understand how different personality characteristics manifested in the body. This became the focus of his university dissertation and ultimately his life’s work. According to James Arraj’s stimulating book, Tracking the Elusive Human: Part II 4 (a must-have for those interested in Sheldon’s work), Sheldon commenced his research by studying the physiques and personality traits of thousands of college males. Eventually, Sheldon concluded that the optimal classification scheme consisted of three primary body types (or what he referred to as “somatotypes”)—the endomorph, the ectomorph, and the mesomorph. Sheldon’s endomorph is characterized by a preponderance of body fat, which gives a rounded appearance of the limbs, face, and trunk. Sheldon theorized that endomorphs possess longer digestive tracts, allowing for more efficient absorption and retention of calories. The mesomorph is characterized by a predominance of muscle tissue, sporting a broad and muscular frame. Their overall shape is squarer than that of the other types, including a heavier, often chiseled jaw. Because muscle and bone are denser than fat, mesomorphs are generally of higher body weight than comparably sized endomorphs. Mesomorphs also tend to look more mature in their appearance and usually undergo puberty at an earlier age. Sheldon’s third and final type, the ectomorph, is characterized by a narrow, elongated appearance through the limbs and trunk; their overall shape is well described as linear. Of the three types, ectomorphs have the lowest body weight with respect to their height. They tend to be “late bloomers” and exhibit a corresponding youthfulness of appearance. As mentioned earlier, Sheldon was not merely interested in identifying different body types, but was driven by an intense curiosity regarding their relationship to personality traits. To investigate this body-personality interface, Sheldon developed and administered personality questionnaires and conducted multiple interviews with each of his subjects. He then employed a battery of statistical analyses to identify potential relationships between the somatotypes and various personality characteristics. What he discovered was nothing less than fascinating. Sheldon found that endomorphic individuals typically appeared relaxed and reported a marked enjoyment of food and other sensory pleasures. Indeed, the “eat, drink, and be merry” notion well have originated with an endomorph. In Myers-Briggs parlance, the endomorph tends to prefer extraversion (E) and sensing (S), or in Jungian terminology, Extraverted Sensation (Se). Sheldon found that mesomorphs were characterized by assertive, aggressive, dominant, and confident personalities. They were fearless in venturing out into the world, interacting with new people, and asserting themselves. Like the endormophs, they too were likely to be extraverted (E). Ectomorphs, according to Sheldon’s research, were characteristically more tense, anxious, self-conscious, and mentally intense. They reported a greater need for privacy and solitude, as well as a propensity to reflect on their thoughts or emotions. It is here in Sheldon’s schema that we encounter the introverted (I) and intuitive (N) personality types. With that said, Eysenck disagreed with Sheldon’s assertion that endomorphy was a distinct body type. In concert with other theorists, Eysenck believed there were only two primary types—the ectomorphic introvert and the mesomorphic extravert—either of which might add body fat and thereby appear endomorphic as a result of lifestyle or other factors. 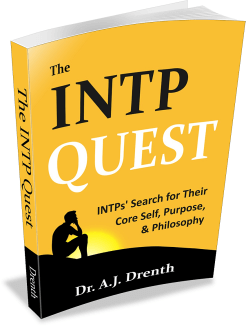 My experience is consistent with Sheldon’s and Eysenck’s view that introverts, especially intuitive introverts, are typically of ectomorphic build, while mesomorphs are usually extroverts and / or sensing types (e.g., Many, although certainly not all, ISP athletes display significant mesomorphy, although typically less than ESPs). 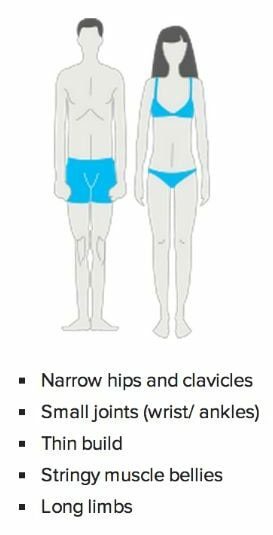 In addition to faces and physiques, people also differ significantly when it comes to bodily symmetry or proportionality. Some individuals, for instance, are thicker and heavier in the lower body, while relatively thin and slender through the arms and torso. In such cases, it can be difficult to readily determine their somatotype. Fortunately, assessing bodily proportions may also provide useful information about an individual’s personality type. >Bodymind, a book by Ken Dychtwald, is a popular reference for those interested in assessing the mind through the body.6 Dychtwald begins by dividing the body at various points such as the waist, neck, and right and left halves of the body. This makes it possible to examine the relative symmetry and proportions of various bodily regions. For our purposes, we will discuss only one of Dychtwald’s divisions, that of the upper versus lower half of the body. According to Dychtwald, the upper body can be associated with action and expression, including our level of physical activity and how we relate to others. Thus, an individual with a prominent or “barrel” chest and muscular arms, combined with more meager legs, is likely to be extraverted. Extraverts also tend to stand tall and open (as do J types), exuding a confidence and willingness to confront and engage with the world. By contrast, Dychtwald suggests that introverts often exhibit a more substantial lower body coupled with less development of the chest, shoulders, and arms. Many display a characteristic rounding of the upper back and shoulders, as though their back muscles are not strong enough to hold them upright. This may also reflect a tendency for them to fold under outward pressures or to withdraw inwardly. Moreover, many introverts habitually cross their arms or legs, an unwitting sign that they are closed, guarded, or otherwise uncomfortable. 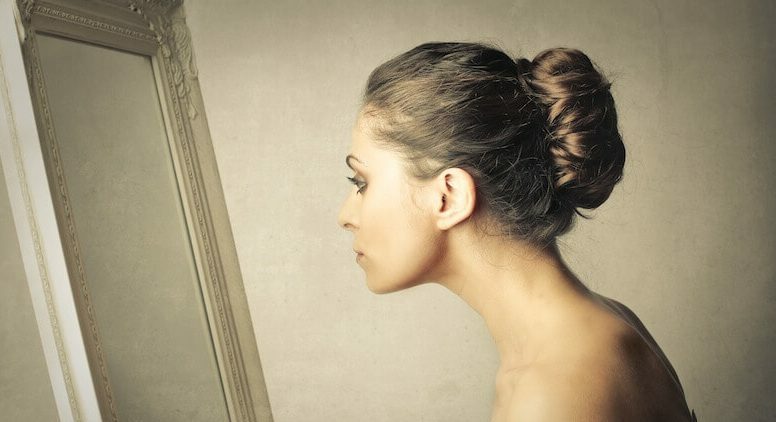 Whether we realize it or not, we are constantly “reading” others’ faces and body language, sizing up their character and evaluating their intentions. While far from being exact sciences, there appears to be at least some measure of insight that can be gleaned from studying face reading and body typing. My experience as a typologist and people-watcher is in large part consonant with the research and observations presented above. In my view, introversion and extraversion are by far the easiest personality elements to identify visually. If pushed to give an estimate, I might contend that I can visually identify the I-E preference in nearly two-thirds of people relatively quickly. While introversion and extraversion can be discerned through the face alone (as evidenced in the above study), when facial information is combined with other observations—body type, posture, body language, etc.—ease of identification becomes even greater. This squares with the findings of Sheldon, Dychtwald, Eysenck, and others, all of which point to the I-E preference as the most overt and readily identifiable body-personality characteristic. I also feel fairly confident reading T-F differences and do so mostly through facial data. I suspect our powers of T-F discernment are rooted largely in our perception of faces as masculine or feminine, which we then tend to associate with T and F respectively. Beyond the fact that N types are more apt to be ectomorphs than S types, it can be difficult to discern S-N or J-P differences based strictly on raw facial or somatotypic data. Things such as clothing and make-up may offer additional clues. NPs and SJs, for instance, typically wear less make up and dress differently than say, ESFPs. However, it is often necessary to incorporate an assessment of an individual’s mannerisms and verbal interactions to diagnose his or her S-N and J-P preferences with a greater level of confidence. Penton-Voak, et al. “Personality Judgments from Natural and Composite Facial Images: More Evidence for a ‘Kernel of Truth’ in Social Perception.” Social Cognition. 2006. Another intriguing facet of face reading is evaluating eye movements, including how they reflect the cognitive function (e.g., Ni, Fi) being employed. 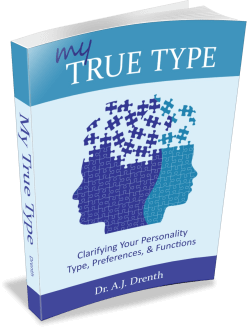 See my book, My True Type, as well as J.E. Sandoval’s Cognitive Type: The Algorithm of Human Consciousness as Revealed via Facial Expressions, for more on this. Sheldon, William H. The Varieties of Human Physique (An Introduction to Constitutional Psychology). Harper & Brothers. 1940. Arraj, J. Tracking the Elusive Human: Part II: An Advanced Guide to the Typological Worlds of C. G. Jung, W.H. Sheldon, Their Integration, and the Biochemical Typology of the Future. Inner Growth Books. 1990. Eysenck, H. The Structure of Human Personality. John Wiley & Sons. 1953. Dychtwald, K. Bodymind. Tarcher-Putman. 1986. Isn’t there an issue with the fact that Sheldon only studied males? Seems his research findings would be skewed by missing data from half the population. Thanks for your comment. I think Sheldon was to some extent going after the “lowest hanging fruit.” Most agree that it is easier to face read (as in the study I described) and body type males because they tend to have a lower overall percentage of body fat, making their bodily lines more readily apparent. I don’t recall, off the top of my head, whether Sheldon ultimately studied women or not. That said, your point is well taken. To make his theory more generalizable, Sheldon would have been wise to include analyses of women as well. I find all of this fascinating. I’m just a baby in the typology world, but interested in intersecting my other knowledge bases and experiences (and of course anecdotal evidence) with what I’m learning. 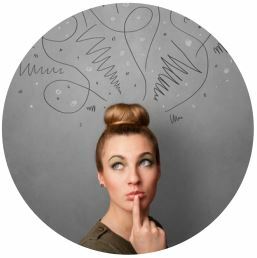 Is there much research done on gender gap in typology theory? I’d be keen to explore it. I am an INTJ female and have an “hourglass figure”, which is not at all skinny, yet not classically obese. It has nothing to do with caloric intake. I am a very picky, healthy eater. It definitely can cause confusion with others, particularly colleagues since my body and brain don’t seem to “match”, in the sense that I am curvy and very feminine in build, yet very direct and scientific in my conversations. My preference for science and my profession in medicine seems to be in contrast to my appearance. And there is no hiding it. I have studied various constitutional theories and find them to be intriguing. I feel like with females, however, there can be such a strong hormonal component ( read, estrogen) that it really can seem to be impossible. Just a thought. I do think that, in general, more of the sanguine, extroverted personalities tend to carry extra weight due to the reasons mentioned above. Thanks for your comment Teresa. I agree that hormones are likely to play an influential role in our body type. Moreover, as you are certainly aware, there are always exceptions to the general trends. Jung himself was a great example of an intuitive introvert who was by no means ectomorphic. He was familiar with Sheldon’s work and at one point even commented on his own apparent mind-body mismatch. 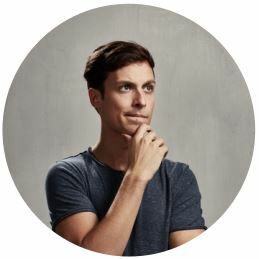 I am an INTP male with a shortish mesomorph frame (5’8″ 170 lbs) and have also noticed that people are often thrown off by the counter intuitive combination of my ESTP-like body features and blank INTP gaze and closed posture. Thanks for this blog and your books. I always learn something new! I’m a firm believer that the body not only reflects the personality but actually is the personality, in the sense that the two cannot be separated and therefore cannot be different. (Even Freud said that the ego is a body ego.) Thanks for the mention of Bodymind by Dytchtwald. I’ve just ordered a copy. Two other major mind-as-body theorists are Wilhelm Reich and Alexander Lowen. Reich had some very strange ideas, which Lowen toned down and developed into bioenergetics, a psychotherapeutic approach that combines mind and body. Both men, and their later disciples, had fascinating ideas about how the personality is revealed through body characteristics. The Energetics Institute (https://energeticsinstitute.com.au/psychotherapy-counselling/characterology/) has a good overview of the five body types and their corresponding character types. Thanks so much for your comment. I’m very familiar with the work of both Reich and Lowen and, like you, tend to prefer the latter. I’ll be sure to check out the link you provided. -A.J. Fascinating article. 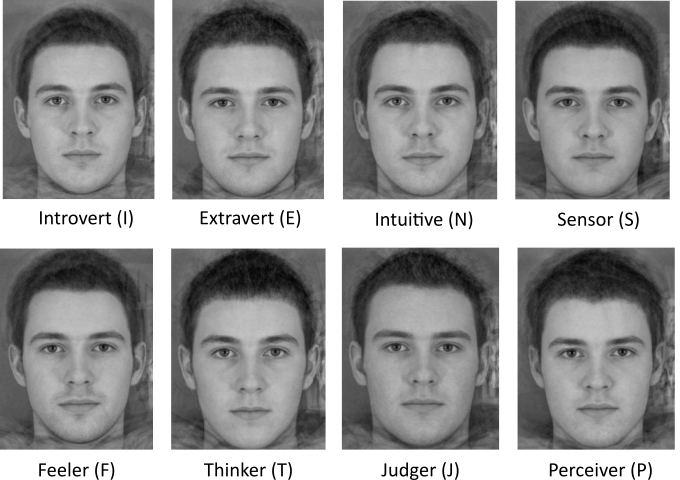 The composite images related to personality traits are particularly compelling. Thank you for your research on this topic. I’m definetly a mesomorphic body type but I am the most N type you’d ever meet. I am an iNFJ but very athletically built. I know I’m a rare type because I’m a dominant personality by the looks of it, and occasionally by actions (especially when I was younger), but I’m very much in my head and enjoy theory and people watching/figuring out. I can appreciate the generalizations here, and from my own experiences and observations, would agree they are accurate stereotypes. As usual though, there are exceptions. I would say that the western diet and hormone disruptions from environmental factors play such a HUGE role in appearances that this line may be blurred for more and more people and types. Great article! This information reminds me of Dressing Your Truth where everything is based on face and body profiling. See dressingyourtruth.com. 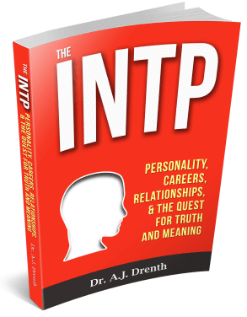 Also, do you plan to make an INFP v. INTP clarifier? Those are the two I am confused about. Thanks! Fascinating that drastically different bodies of work somehow draw parallels. There is a similar body of work theorized by an ancient healing system in India called Ayurveda. Ayurveda is a 5000 year old Eastern philosophy that states that there are three type of constitutional energies: Vata, Pitta and Kapha. These three type correspond more or less to Sheldon’s ectomorph, mesomorph and endomorph types respectively. 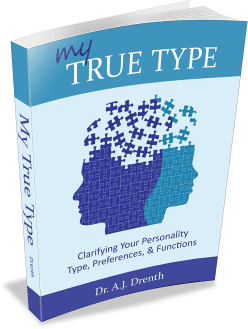 Both physical and personality traits are determined by one’s type. Sometimes, when multiple schools of thought conclude the same thing independently, I feel inclined to look deeper into it. Thanks for the post! I have always felt you can tell what type a person is largely from their eyes, then afterwards looking at their body type and clothing to strengthen that hypothesis. People don’t like it when I say that, because it’s very “judging a book by it’s cover” but, I notice a distinct quality in the facial expressions and eyes of people of certain types.